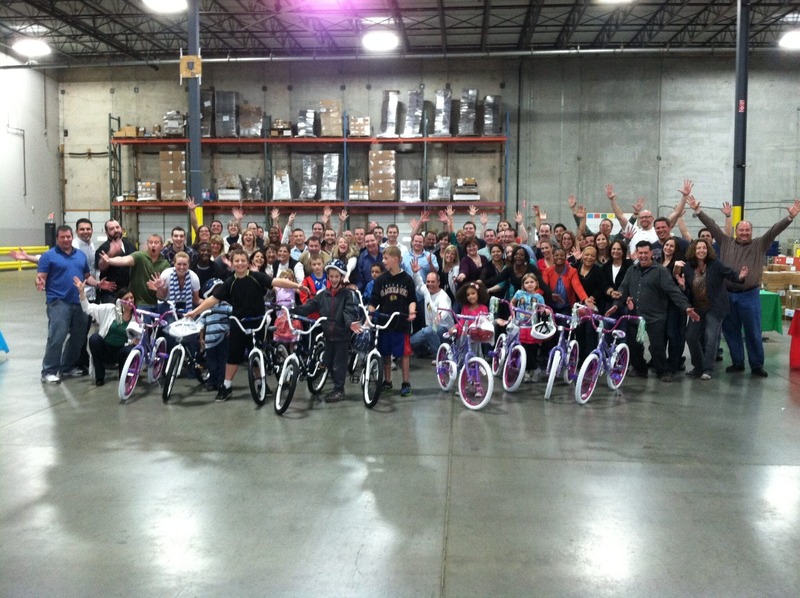 Follett Educational Services held a sales meeting for 75 of its sales people in the Chicago area recently and included a Build-A-Bike charitable team building workshop as a way to give the participants a high-energy experience with a philanthropic surprise at the end. Follett Educational Services (FES), one of several Follett Corporation operating companies, has a long and successful partnership with the education community. It all began with Charles W. Follett in a small bookstore back in 1873. Today, at their state-of-the-art facility, they process and house the largest pre-owned textbook inventory in the nation, including millions of K-12 textbooks by publishers in every subject area and grade level. 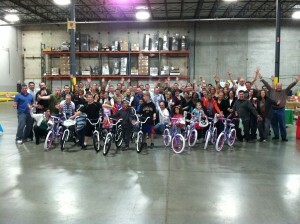 In fact, this high-energy event took place right in their warehouse space! Throughout the event, there was a lot of energy and a strong air of competition! The initial activities presented opportunities for the teams to step outside of their comfort zones. The level of enthusiasm in the room was impressive! Everyone had a great time cheering for each other and showing off their creative sides. The main portion of the program required the participants to abandon their competitiveness and work together to gain knowledge and resources in order to be successful. Skeptical and a little reluctant to share what they each had at first, eventually everyone adopted a spirit of cooperation and together they were able to build 16 bikes for kids. The local YMCA club brought 16 boys and girls to the event to be the excited recipients of the bikes at the end of the program. All the tension and struggles of learning to work more cooperatively melted away as the participants looked at the kids’ faces. Everyone likes to have fun, and everyone likes to make a difference to children in their communities. Build-A-Bike team building event is a great way to combine the two and add a new dimension to any corporate gathering whether in Chicago, Illinois or any major city. For details about a team building event in Chicago, Illinois, click here!